I was here a year ago. I think on that day we arrived a little late and missed part of Evensong, I don’t even remember having a service book. I suppose I must have had one, but all I remember is being unsure of what I was attending. Yesterday evening I was back, and it was such a different experience. St. Julian’s is a Church of England church, but very much an Anglo Catholic one. Around the walls are the Stations of the Cross, there is a statue of Our Lady where you can light candles, there is a lot of incense.There is also a lot of genuflecting, people crossing themselves, chanting and traditional language. Just a few years ago this would all have had me running for the hills. But my faith has changed shape and now this all seems a lovely way to worship. Here is something I have had to unlearn: Anglo Catholics are not snooty people, not aloof or puffed up in any way. On the contrary, the people I have met at St. Julian’s are some of the friendliest, most gentle and humble people you could ever meet. For some reason I thought for the longest time that Anglo Catholics would be hi-fallutin’, perched up on their smugness. How wrong I was. St. Julian’s is not just another church that I visit sometimes. Two years ago I became a Companion of Julian of Norwich and so make a kind of pilgrimage here in the summer, to spend time at the Julian Shrine (attached to St. Julian’s) and to see the people here, to reconnect. I wonder how much difference that makes to how welcome I feel, since I am, in some ways, coming home. People ask me, are you a visitor? Yes, I am, but I am also a Companion of Julian, I belong here. Yesterday evening I was made welcome, and given all the books and sheets of paper I needed. The wife of one of the priests made sure I knew what was needed when. I sat for a while before the service and looked through the service book. Although it was traditional language and more would be chanted than I was used to, it was familiar enough. It was a regular service of Evensong, with the Benediction after that. A Service of Benediction. Amazingly simple, but also potentially mind-bogglingly perplexing. I suppose the crux of it is, do you believe in transubstantiation? Do you believe that the bread and wine literally become the body and blood of Christ? Or do you believe that they are symbols of the same? Believe the former and a Service of Benediction is for you. Believe the latter and I don’t know what you make of it. This has been part of my journey, too. Not so long ago I would have said that the bread and wine are symbols of Chirst’s body and blood. But in Tokyo I serve as a Lay Eucharistic Minister (LEM) and administer the chalice at the Eucharist. Some Sundays I look into the chalice and see that the wine has become blood. I have seen that. I can’t explain it, but I look into the chalice and it’s no longer wine. I drink, and it’s still wine, but in my heart I know it’s not. At a Service of Benediction, a consecrated host (wafer) is put in a monstrance, which is an elaborate and beautiful container for the host. A monstrance is usually round, almost like the sun, with rays radiating out from its centre. 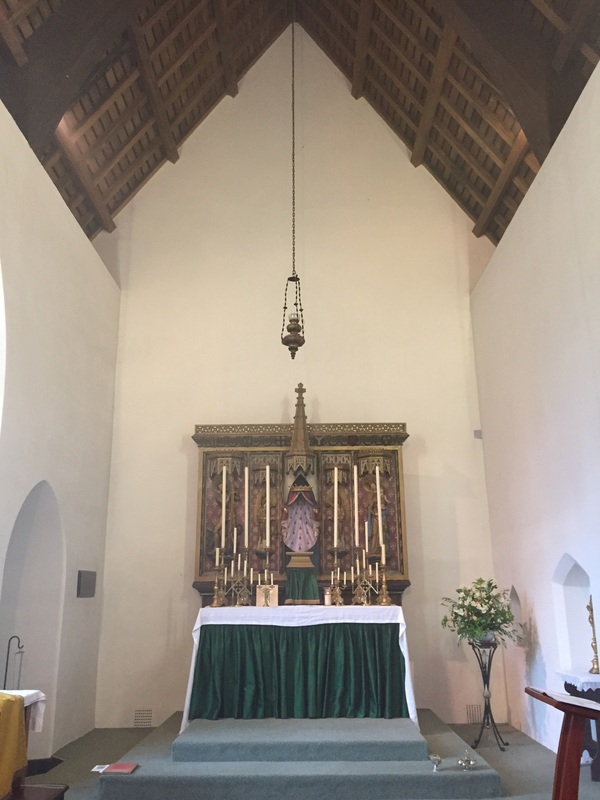 It is on a stand, which is first on the altar, and then lifted by the priest to bless the people. I attended the service last year, and went back to Tokyo perplexed. It was a consecrated wafer. On one level I knew that it was the body of Christ, but on the other . . . really? I asked my priest, if that is how we can be in the presence of the consecrated host, then surely at every Eucharist we should be beside ourselves? Yes, he said. St. Julian’s has a Service of Benediction at 6:30pm on the first Sunday of every month. I timed my arrival so I could attend. I wanted to try again. I had spent the last year thinking over what I had seen at the Service of Benediction, I felt better prepared, ready. Evensong was beautiful, the sanctuary was full of incense, the canticles were lovely. Both priests (one the parish priest, the other a retired priest) knelt before the altar, offering more incense. The parish priest was wrapped in a further vestment before he picked up the monstrance. We were already on our knees. As he held up the monstrance, we bowed our heads. With tears in my eyes all I could do was repeat the Jesus Prayer. In the presence of such holiness, what else can you do? I totally got it. I loved it. After the service, someone approached me and asked if I was a visitor. When I told him I was, but that I was also a Companion of Julian, he told me that he had noticed me and wondered if I would know what to do ‘but you knew how to do everything’. Yes. Yes I did. Because now I am Anglo Catholic too. I know there is a Service of Benediction once a month in Tokyo, and I’m going to find out where it is. I don’t want to wait another year. This entry was posted in CJN, Julian of Norwich, Travel and tagged Anglo Catholic, Church of England, CJN, Companion of Julian of Norwich, Evensong, genuflecting, incense, julian shrine, Lay Eucharistic Minister, LEM, monstrance, Norwich, Our Lady, pilgrimage, Service of Benediction, St. Julian's, Stations of the Cross, transubstantiation by tokyopurplegirl. Bookmark the permalink.